Norwalk High School's #23 Dale Donovan shoots past Hamden Varsity Boys Lacrosse #18 Patrick Rice Saturday, April 14, 2018, at Norwalk High School in Norwalk, Conn. 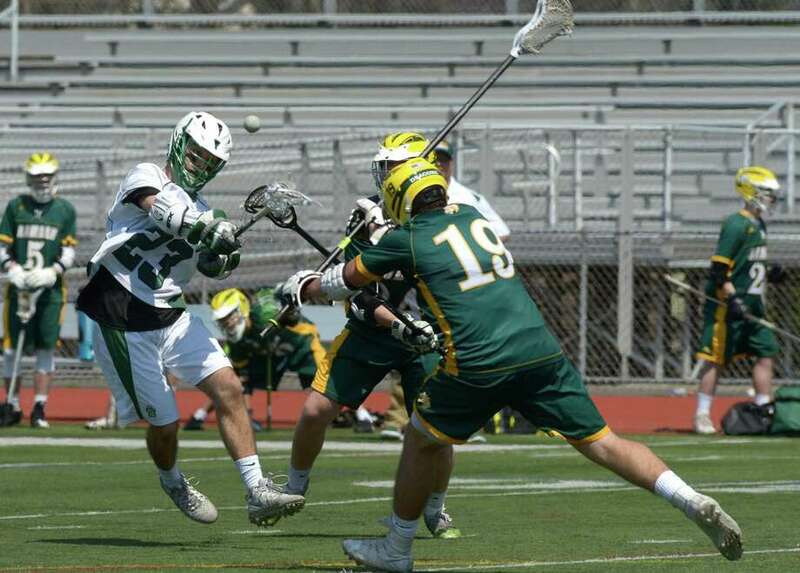 The senior defensive middie went the length of the field with the ball, racing on goal when nobody picked him up, and scored in his first career goal to provide one of the highlights in Norwalk’s 16-3 win over Hamden on Saturday at Testa Field. Despite Brown’s newness, the two-year Norwalk High football standout (he transferred in from New York City his junior year) has been an important addition to the team. While Brown’s first tally was an emotional high, Norwalk’s more experienced players made the win possible. David Lamb scored two of his three goals in the first quarter as the Bears raced out to a 4-0 lead against the Green Dragons. Lamb scored the first two goals with Donte Salano and Michael Propersi also tallying single goals. “We got the lead and we were able to hold it for the rest of the game,” Adams said. Build upon that lead was more like it. Norwalk exploded for five more goals in the second quarter and four more in the third. Dale Donovan scored five goals with an assist while AJ Hall had four goals and three assists. “Hopefully, this type of effort really boosts everybody’s confidence and we can come back even more confident in our next game,” Hall said. Victor Espinoza and Sean Warde also tallied goals. Patrick Ruther made 9 saves in the game, including five in the third quarter. Norwalk, sparked by Quint Bartush, won 16 face-offs compared to five for the other team. The Green Dragons (0-5) never gave up, scoring two of their three goals late in the fourth quarter. Sam Levine netted two of Hamden’s goals while Payten Nevins had the other. Goalies Chaz Cox and Kevin Collins split duties, combining to make 12 saves.